Thankfully more and more schools are serving healthier choices at lunchtime. Unfortunately, kids aren’t always accepting or eating those choices. In reading a NPR report on getting children to actually eat these healthier school lunches, I came across a term that piqued my curiosity: libertarian parternalism. The basic idea is that private and public institutions might nudge people in directions that will make their lives go better, without eliminating freedom of choice. The paternalism consists in the nudge; the libertarianism consists in the insistence on freedom, and on imposing little or no cost on those who seek to go their own way. New nutritional guidelines, announced in 2012, require public school lunchrooms to offer more whole grains, low-fat milk, and fewer starchy sides like French fries. But short of stationing grandmothers in every cafeteria, how do you ensure that students actually eat the fruits and veggies they’re being offered? A minor lunchroom makeover could make a big difference, says Andrew Hanks, a behavioral economist at Cornell University. In a study published online by TheJournal of Pediatrics, Hanks and his colleagues David Just and Brian Wansink, at the Cornell Center for Behavioral Economics in Child Nutrition Programs, demonstrate that small, simple changes in presentation and layout can have a large impact on how — and what — students eat. Similar product-placement tactics have proved effective at getting grocery store shoppers to buy more produce. 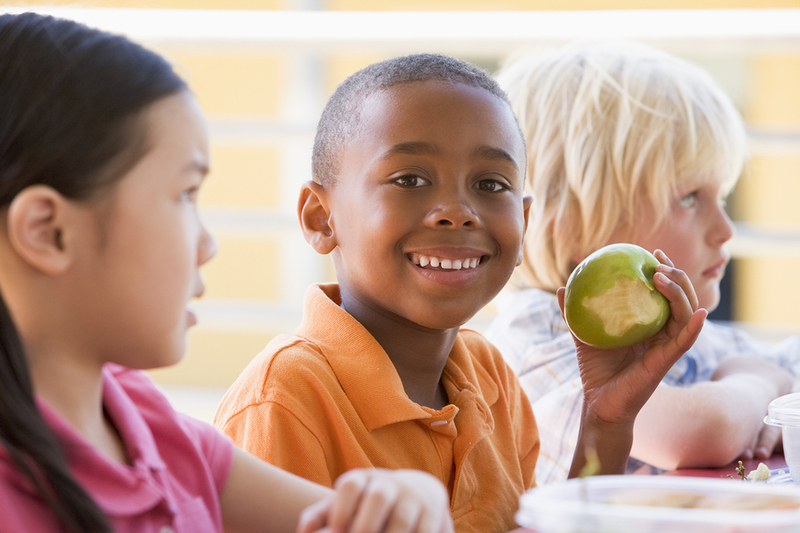 And amid rising childhood obesity rates, there’s been a surge of interest in recent years in applying lessons from behavioral economics to getting kids to make better choices in the lunchroom. Hanks spent two weeks in New York junior high schools, observing students’ dietary choices before and after what he calls a “smart lunchroom” makeover. The makeover required three hours and cost less than $50. In a “smart” lunchroom, the authors found, students were 13 to 23 percent more likely to take a fruit or vegetable, and 10 to 15 percent more likely to eat the whole thing. This is a tactic behavioral economists call “libertarian paternalism,” a term coined in the early aughts by the University of Chicago’s Richard Thaler and Cass Sunstein. Impel students to take boiled spinach by slopping it on their plates, and it’ll be scraped straight into the garbage. Encourage them to take the veggie with a subtle nudge — no ultimatum, no “Because I say so” — and chances are they’ll actually eat it. Instead of the lunch lady saying you have to take some carrot sticks, children chose on their own because the carrot sticks look more attractive than the tater tots. When children own the choice, they are more willing to actually eat the food on their tray. This premise makes sense, but why even offer anything but healthy choices? If you fill your home (and school lunchroom) with only healthy choices, then there can be no wrong choice. No need to place healthy food choices strategically to influence behavior…I don’t understand why we serve crappy food anyways. Oh yea, it’s the budget. Artificial ingredients and preservatives make food cheaper. I don’t get that. More generally, the flaw in some forms of libertarian paternalism is that the free choice that it appears to offer leaves the paternalism largely unconstrained. Would it not be far better to force conscious choice in order to limit the consequences of paternalistic mistakes? One of my early parenting lessons was about choice. Instead of telling children want to do, offer them a choice, but be sure you are happy with both choices. This is what I think needs to happen in school lunches. We don’t need to manipulate children into choosing healthy food over junk, rather we just need to make sure that the only choices children have are choices we can live with, or more importantly their bodies can live with in health. Thanks for the article. For info on people using voluntary Libertarian tools on similar and other issues worldwide, please see the non-partisan Libertarian International Organization @ http://www.Libertarian-International.org ….